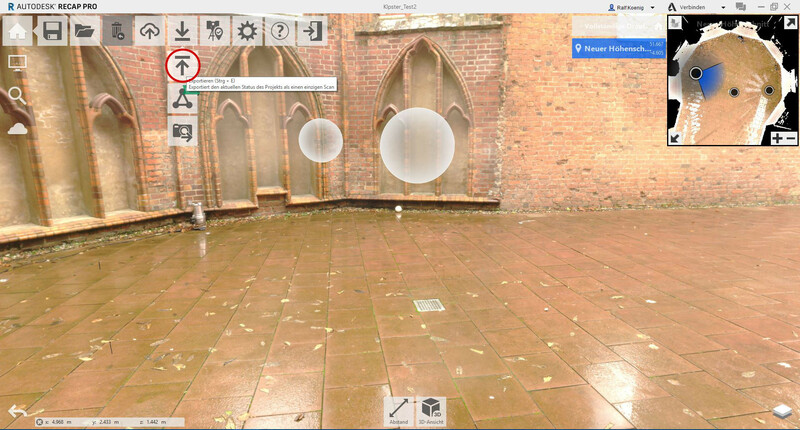 We have scanned a project with the Leica BLK 360 3D Scanner and done the registration with Autodesk ReCap Pro (mobile). Would it be possible to use this data with Scalypso modeler? 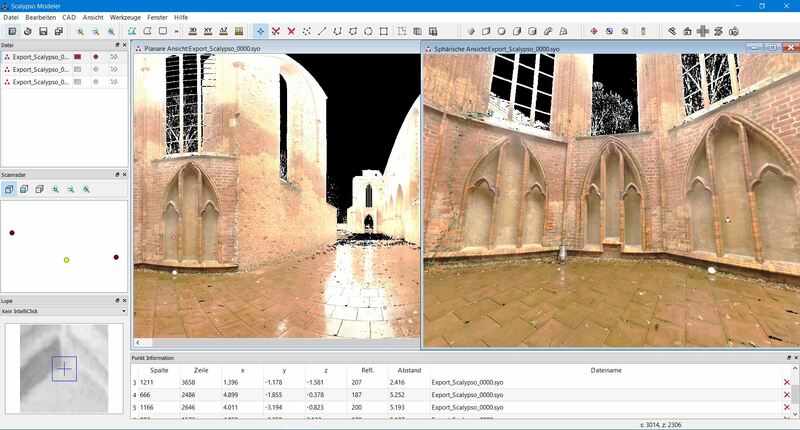 To use Leica BLK 360 scan data within Scalypso you have export the registered project from Autodesk ReCap Pro as e57. It is important to do this before you save a project as a ‘unified’ format. Otherwise, the scan data is merged into a single point cloud and could not be separated using the single scans station positions. Fig. 1: Registered Autodesk ReCap Pro projekt with seperate scan station positions. Fig. 2: e57 format selection. Fig. 3: Dialog after exporting the project using the e57 format. The whole Leica BLK 360 project will then be exported into a single e57 file and multiple laser scans are saved in separated sections. Afterwards, the Scalypso Converter can import this information without any problems and generate a Scalypso readable format. If the e57 file is exported as „3D-only“ noisy 3D points will be filtered, resulting in an reduced file size. However, this step cannot be reversed afterwards and perhaps some needed information can get lost. If you are not sure which variant is the better solution for your needs, we would suggest to try it out with a small subset of your project. 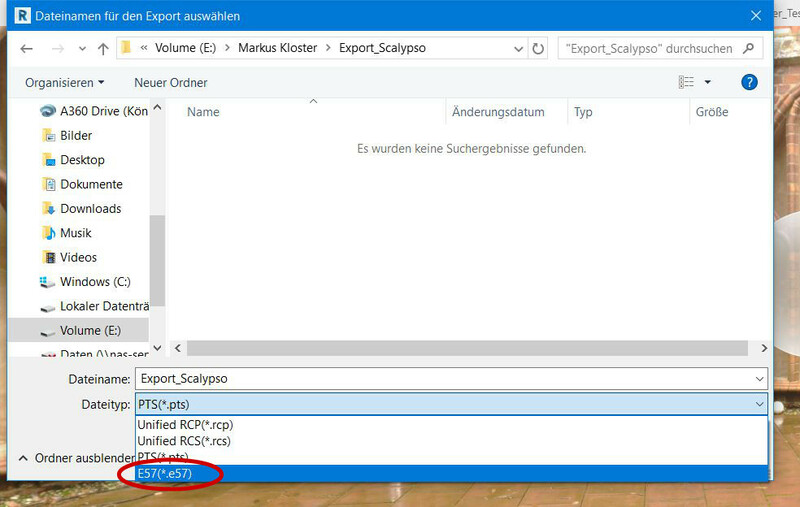 The Scalypso Scan Converter will make use of multiple e57 parameters that were written by Autodesk ReCap Pro during the export. 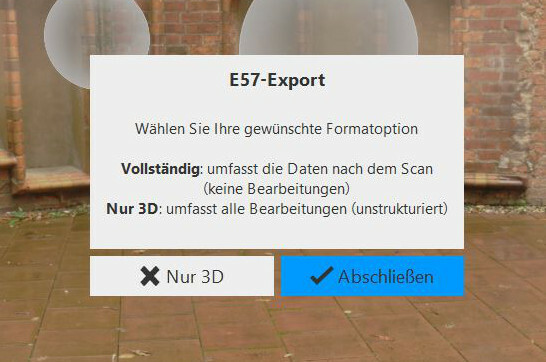 As a result, multiple separate scans will be generated again from the single e57 file. After opening the result within the Scan Modeler analyzing and reconstruction task can be done as with all other data sets (Fig. 5).